With the leading actors ready to go, this online game will have you falling for its Hollywood glamour. Everyone loves a good out take reel at the end of a movie and Bloopers is a game loosely based on just that. Boku Slots enjoyed poking around behind the scenes of this Elk Studio’s game and we think it has a lot to offer. Bloopers is a 5-reel, 243 ways to win game with an RTP of 96.10% for players to enjoy. The soundtrack making up the Bloopers theme is positively Hollywood all the way and, in all honesty, it can get a bit much after a while. Good news, you can switch off the music and leave the sounds on, or switch both off in the settings. Bet Amounts – Betting on Bloopers begins at 25p per spin and can be increased to a maximum of £100 per spin. To amend your bet you need to click on the coin icon to the left-hand side of the screen, choose your bet amount and then click spin. Wild Symbol – In Bloopers the wild symbol is depicted by the word wild across the Bloopers logo, it will substitute for all other symbols except the star bonus. Bonus Symbol – Land three or more of the star symbol and you will trigger the bonus spins feature. You will also see on the last star the image of one of the blooper characters, this will be the blooper feature that will be active within the bonus game. Bloopers Symbols – There are 5 Blooper character symbols in the game and each one offers its own little treat for you. Yellow Blooper awards random wilds. Bloopers symbols are random and can land at any point during the game, sometimes more than one can appear at the same time. You are guaranteed that at least one blooper will land during the bonus feature too. Bonus Spins Feature – After you have landed the three bonus symbols, you will be awarded your bonus spins. During this round your male and female actors are sticky wilds and as they land on the reels, they will then expand with each spin. Whilst there are no minimum spins allocated you will spin the reels until one of the two lead characters fill the reels. However, there is a twist, the blooper characters can expand your spins and delay the end of the round increasing your chances of bigger wins. Optimiser – Choosing this route allows your bet to be changed automatically, dependant upon your current balance. Leveller – This option will increase your bet amount by two steps, after five consecutive losses are accrued. 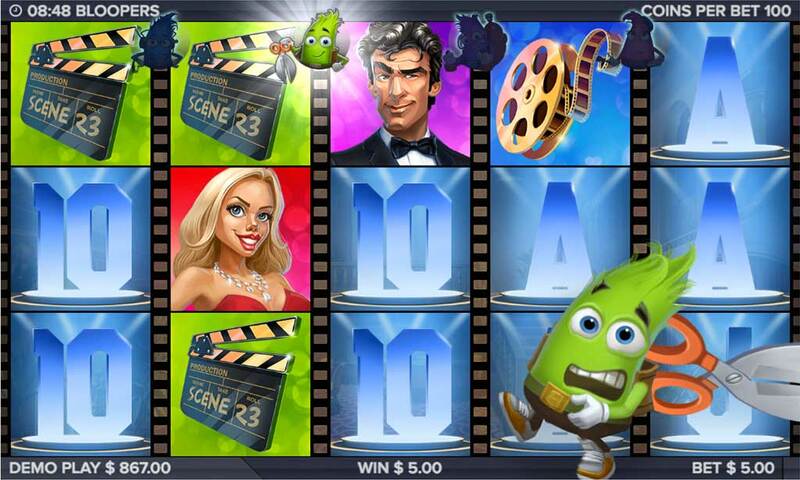 Booster – Consider this one to raise your bet by one step after each spin and it will automatically reset after a win. Jumper – This will increase your bet after each win by one step and will reset after a loss. If you haven’t already guessed there is a lot more to Bloopers than meets the eye. It can be quite complex if you want it to be or as simple as you need it to be, which is the joy of this game. We love the animations when the Bloopers characters come to life and sweep across the screen. The wins came quite often and even the bonus spins work out in your favour, despite the lack of an allocated amount of spins. Overall the game is quirky and will win you over once you have played a few rounds.